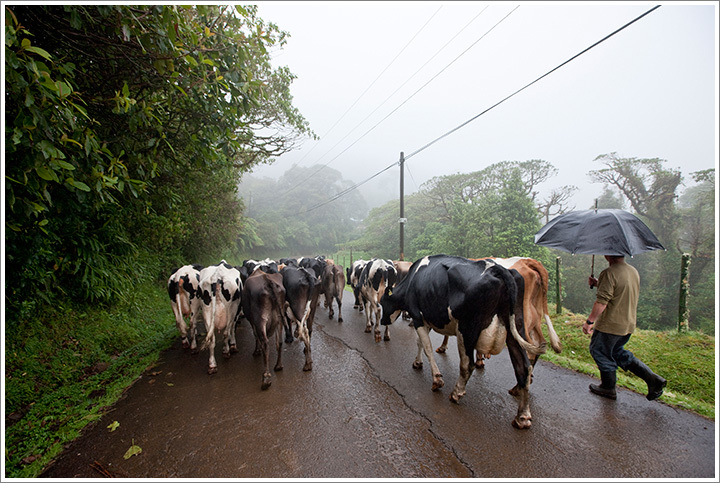 A farmer walking in the rain with his herd of dairy cow in the mist on the slopes of Volcan Poas in Costa Rica. Photographed with a Canon EOS-1Ds Mark III camera and 16-35mm f/2.8 lens. Exposure 1/250 at f/5.6. This entry was posted on Tuesday, January 20th, 2009 at 8:14 am. It is filed under On the Road and tagged with Central America, Costa Rica, Travel. You can follow any responses to this entry through the RSS 2.0 feed.